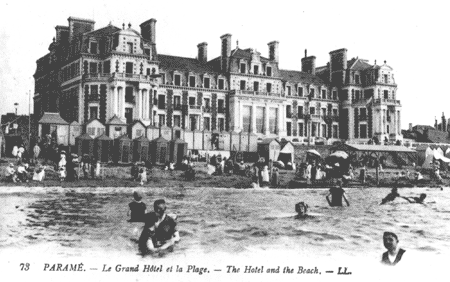 Even by the mid-19th century, the vast Sillon beach was seeing its first bathers. These bathers were soon to become “the very first thalassotherapy clients” who were enjoying the first beach for holidaymakers; there was even a boiler on wheels, which enabled people to take warm seawater baths in wooden tubs… Would this be how thalassotherapy originated? The building that now houses the Thermes Marins was built in 1881 as the Grand Hotel de Paramé, a fashionable resort and a favorite residence of the Grand Dukes of Russia. It was in 1963, under the leadership of Dr. Heger that the thalassotherapy center was created. Finally, with the arrival of Serge Raulic in 1981, the Thermes Marins de Saint Malo developed into one of the leading French centers with high-quality, modern facilities: The Grand Hotel des Thermes preserved its majestic architecture whilst opening up to modernity and creating the Thalassotherapy Center & Spa; Thermes Marins de Saint Malo, leader in French Thalassotherapy. 1880 : Construction of the Hotel de Paramé, the most luxurious in the region. 1963 : Opening of a thalassotherapy center at the hotel. 1981 : Serge Raulic became head of the facility and began major renovations. 1987 : Creation of the Aquatonic pool and Spa des Thermes.